Cinnamon, the sweet-smelling spice that adds gentle heat and richness to apple and pumpkin pies, can also be used to make a slightly spicy tea. Cinnamon bark, the ingredient needed for cinnamon tea, is made from the cinnamon tree, and you can use either the powder or sticks for brewing. Cinnamon tea is naturally low in calories and can help regulate your blood sugar levels, which could lead to consuming fewer calories and helping with weight gain. A 1-cup serving of cinnamon tea has only 2 calories per serving, which, if drunk in place of other higher-calorie beverages, such as sodas, can lead to fewer calories consumed. A 1-cup serving of cream soda has 126 calories. Over the course of a year, drinking cinnamon tea once a week instead of soda could potentially lead to almost 2 pounds in lost body weight, as it takes a 3,500 calorie deficit to lose one pound of body weight. 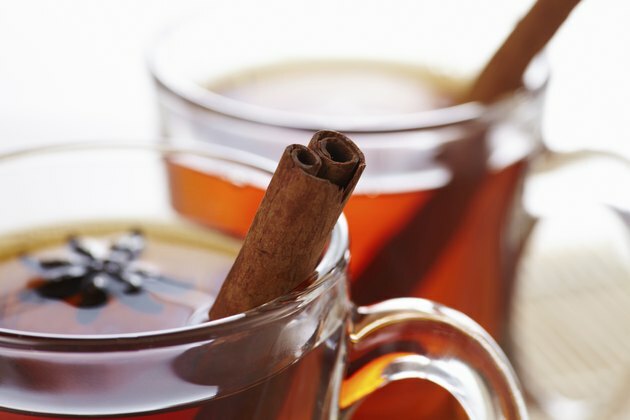 Cinnamon tea's naturally spicy taste means you can have a lot of flavor in one cup without having to turn to sugar. It's naturally sugar-free, so it makes a healthful substitute for sugar-sweetened drinks. Switching cream soda with cinnamon tea, for example, saves you 33 grams of sugar per single cup. A diet high in added sugar can contribute to weight gain and obesity, according to the American Heart Association, which recommends consuming no more than 100 to 150 calories of added sugar a day. In 2011, the "Journal of Medicinal Food" published a survey of studies on cinnamon's effects on blood sugar. Cinnamon, which is high in polyphenols, has been used in Chinese medicine to treat high and uneven blood sugar levels. Researchers found that cinnamon studies routinely showed that consuming cinnamon in the diet led to lower blood sugar levels and blood sugar fluctuations in those with Type 2 diabetes or pre-diabetes, two symptoms associated with obesity. Steadier blood sugar levels can lead to fewer food cravings and more stable energy levels, helping you with weight control and loss. However, the study was conducted cinnamon supplements, not tea, so not all of the benefits found in the study may be present in cinnamon tea. You can make cinnamon tea from whole cinnamon sticks, as well as broken pieces of cinnamon and ground cinnamon. To make cinnamon tea from sticks, you need to boil and steep the sticks. Boil 1 cup of water with a cinnamon stick for two minutes before letting the tea steep for five to 10 minutes. For broken pieces of cinnamon, boil 1 tablespoon of pieces but let it steep for less time. If you do not boil the pieces, submerge them in boiled water and let them steep for 10 minutes. If using ground cinnamon, add 1 teaspoon to 1 cup of hot water, stir to mix thoroughly and then let it sit for two minutes before drinking.